Ingrid Bauer started learning the harp at the age of 11, studying with Carolyn Mills (Principal harp, New Zealand Symphony Orchestra). 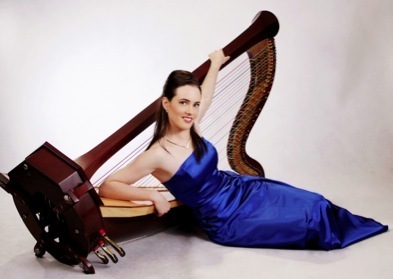 She went on to complete a BMus in Performance Harp at Victoria University of Wellington, and also holds first class Honours from the Australian National University, where she studied with Alice Giles. Ingrid has twice been a semifinalist in the Gisborne International Music Competition, and in 2009 was an invited participant in the ARD International Music Competition, Munich. In 2005 she won the Wellington Youth Orchestra Concerto Competition, and performed Rodrigo's harp transcription of his Concierto de Aranjuez with the orchestra as her prize. The critics described her performance as "lyrical and elegant, with virtuosity, vitality, and tonal colour". Ingrid has also performed as a soloist with the Kapiti Concert Orchestra. Ingrid has a longstanding love of chamber music. In 2002 her flute/viola/harp trio won the Wellington section of the NZ National Secondary Schools Chamber Music Competition, and in 2005 her clarinet/harp duo was one of the winners of the Victoria University of Wellington Duo Competition. More recently, she has performed with Australian jazz legend James Morrison at the Noosa Long Weekend Festival. Ingrid is an inaugural member of SHE, the Canberra-based harp septet. SHE performed in 2006 at the American Harp Society Conference in San Francisco, and in April 2010 released the debut CD, Bolmimerie. Ingrid plays casually in many orchestras, including the Tasmanian, Queensland and New Zealand Symphony Orchestras. From 2002 to 2009 She was principal harp in the New Zealand National Youth Orchestra. Ingrid also holds a BA (Hons) in Philosophy.